Now more than ever, we must ask ourselves: Who are the WE in We the People? 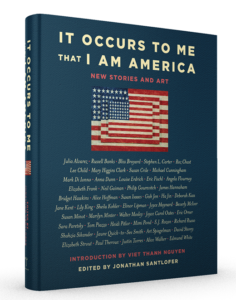 In It Occurs to Me That I Am America, more than 50 bestselling and award-winning authors and artists consider the fundamental ideals of a free, just, and compassionate democracy through heart-stirring and often provocative fiction and art. I am proud to have contributed a piece to this unprecedented anthology, which is being published by Touchstone Books on January 16, 2018, in support of the American Civil Liberties Union (ACLU) upon the one-year anniversary of the Presidential Inauguration and the Women’s March on Washington. Learn more and pre-order It Occurs to Me That I Am America at iamamericabook.com.